The shuh’s (think of the sh sound) really represent in the fabulous author category. This installment includes one of my favorite authors (Shute), the author of two of my favorite books (Sherriff), an author who wrote wonderful books and died too young (Shields), and another who I think is totally charming despite loving one of her novels and disliking the other one that I read, but whom I still have high hopes for (Sharp). Not to mention Schlink who not only sounds like a shuh, but who writes amazingly good novels. Having said that, you all SHould definitely read some of my favorites on this page. If you need help where to start drop me a comment. Nancy Pearl “told” me to read Schine. So far I haven’t been able to get into it. Fingers crossed. Somehow this one has disappeared from my shelf and I don’t know why. I am pretty sure I didn’t weed it out, so it must be in a pile somewhere in the house. I find Schlink’s novels (the two that I have read) to be solid, engrossing, good reads, that offer a lot of food for thought. Both this and The Reader deal with the moral and intellectual aftermath of Nazi Germany. I read this a million years ago and loved it. A gay coming of age story in Sri Lanka. Also enjoyed his novel Cinnamon Gardens. Not only did I love this mix of sociology, history, and cello pedagogy, but it gets high marks for depicting the milieu of classical music in an intelligent, natural way. That is hard to find in fiction. I think this was shortlisted for the Bailey’s Prize. I took a chance on buying some lovely copies of Sharp years ago when we were in Maine. Turned out I loved Cluny Brown and so have continued to buy her books. I see here I even have two copies of Something Light which I found quite boring. I love, love, love the two Sherriff reissued by Persephone that I have read (A Fortnight in September and The Hopkin’s Manuscript) and hope these two are even half as good. I am a big fan of Carol Shields and have read all of her novels. The one that gets the most praise, The Stone Diaries, is not my favorite, but still very enjoyable. I hope to read her story collection this year as part of one of my reading resolutions for the year. I got this from a generous reader/blogger, but I don’t remember who it was! Nevil Shute is easily one of my top five favorite authors of all time. His writing is not sophisticated but he is a great storyteller. 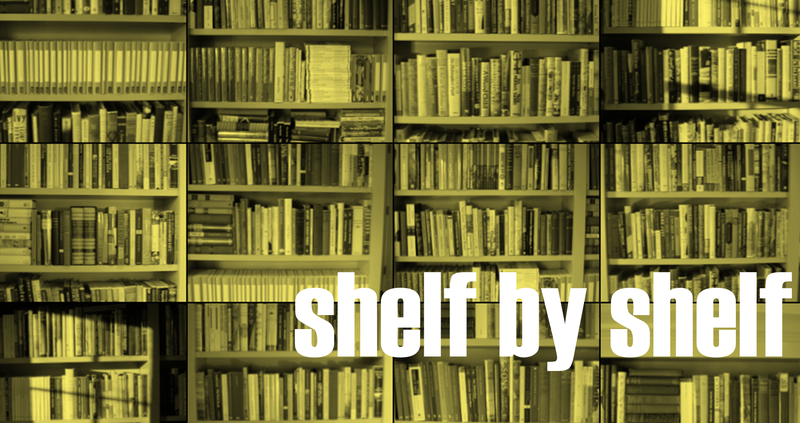 The next installment of Shelf by Shelf will have lots more Shute, so I won’t say too much about him here. The four red-spine Vintage paperbacks at the end are a good place to start if you haven’t read him. I would say On the Beach is the best one to start with. Not only was it an amazing response to the threat of nuclear destruction but it is a page turner with lots of heart and emotion. I first read it in high school and I literally SOBBED for the final 30 pages. Granted it was the Reagan 80s and we all thought we were going to be nuked, but still. A Town Like Alice is the stunning story of a group of Britons caught in southeast Asia during World War II under Japanese occupation and then the story moves to post-war Australia. Pied Piper is the story of an Englishman caught in Europe at the outbreak of WWII and finds himself leading a group of children to safety. Probably the lightest of the four. Requiem for a Wren is perhaps the least compelling of the four, but still a damn good story. I’ve read many of these twice and also listened to audio versions. They make really great listening, however, some of the language is not something you want to have blaring out your car window when waiting at a stop sign. More on that in the next installment. Next Article Jinxed by Penelope Lively? The only Shute I’ve read is “A Town Called Alice” but now I’m inspired to read Pied Piper. A Town Like Alice is also the only Shute I’ve read. It’s a terrific story. Have you seen the 1956 movie with Virginia McKenna and Peter Finch? You’ve inspired me to seek out some of Shute’s other novels. I’ve read Britannia Mews and the Foolish Gentlewoman, she’s a good storyteller and I think you’ll like them. A God in Every Stone I very much enjoyed, I have enjoyed all Shamsie’s novels. Looking forward to hearing about Chedworth not heard of that before. This definitely makes me want to read some Neville Shute. I took some of some of Nancy Pearl’s advice and read a book by Ward Just. I’m not sure I’ll be taking her advice again. Some years ago I read Bernard Schlink’s short stories, Flights of Love. It is probably the best collection of short stories I’ve read. Oh, she introduced me to Ward Just as well, but I ended up liking him quite a bit. I would start reading Cathleen Schine’s book The New Yorkers. Written after 9/11 as a love letter to the city, she portrays a certain street/neighborhood and its residents and their dogs in ways that are sweet and amusing- kind of like a mixture of Jane Austin, Barbara Pym and Midsummer’s Night’s Dream! I have just been listening for the umpteenth time to Nevil Shute’s Round the Bend magnificently read by John Telfer – such a moving and gripping story with a final sentence that has stayed in my mind ever since first reading the book as a teenager.